When novelist Jim Eldridge receives an invitation to a writer's retreat on Washington State's Mount Misery, it seems like the perfect escape from the last days of his dead marriage. Jim accepts the invitation to the Hacks Club and joins the other guests including the legendary H. Casper and best-seller Heather Woods for a week of fun and relaxation. Someone in those woods is not happy to see them. The body count rises, and the survivors band together to fight the relentless killer. Will they escape the nightmare on the devil's tail ridge, or die trying? Would you listen to Hacks again? Why? I might...that last couple of hours had be on the edge of my seat, and screaming!! OMG...the great escape at the end...just when you think they are in the clear...BAM! I never saw it coming! But, this is an exciting story, a writers retreat gone very wrong! This is a combo, mystery/thriller with some horror and a little romance mixed in...there is a killer in the woods, offing the Hacks/Writers in really horrific and brutal ways....and just when you think the last 4 people are going to make it, and trust me they fought hard to make it, a surprise twist pops up....I was on the edge of my seat the last couple of hours and even screamed out a few times...lol I really enjoyed this, and recommend! I would recommend this book to anyone who loves classic horror books. Would you recommend Hacks to your friends? Why or why not? What about Roberto Scarlato’s performance did you like? The characters are introduced steadily and Robert Scalartos change of tone for each person kept it easy to follow who was talking, or dying! The last few chapters of the book were really quite frightening, I fell asleep one night with the book still playing and the horror earworm made its way into my head giving me a graphic, sweat inducing nightmare. 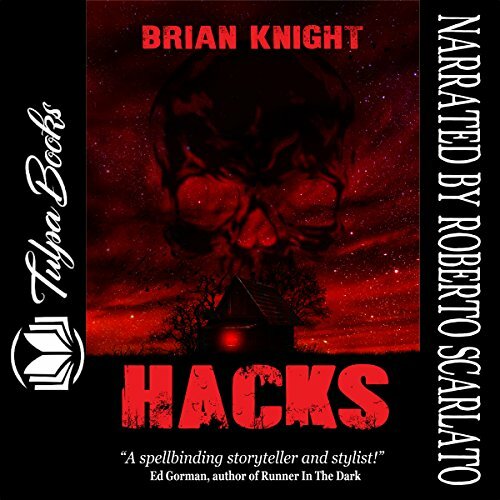 If you loved those 80's horror flicks full of blood, gore and a group of unsuspecting victims being picked off one by one in a cabin out in the woods, then Hacks is the audio book you need to download. This book is vintage horror with a classic storyline and although no surprises or change from the usual horror formula, you will still jump in places and wince at the horror as it unfolds. Expect a couple of sleepless nights!